Some minor complaints aside, this is a great remote. Whether you'll consider it worthy of parting with 100 of your english pounds is another matter entirely. 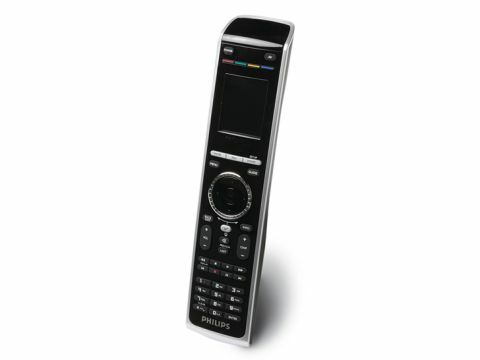 This rather handsome remote from Philips really looks the business with its glossy black finish, large LCD screen and silver rotary click wheel. But does its performance live up to the elegant design? Capable of controlling up to 15 home entertainment products, the remote has a slightly cumbersome design, which doesn't sit comfortably in the hand during use. The first thing that struck us when using the setup wizard was the size of the text on the LCD screen. It's very small, and even those with perfect sight may struggle to follow the onscreen instructions. Having said that, if you are able to read the text okay, then the procedure is a piece of cake. As with the majority of universal remotes, it's mostly a case of choosing the piece of kit that you want to add and holding down a button on the zapper for a few seconds until the product is recognised and its functions stored. There's no need to type in a manufacturer code, as the Prestigo usefully provides an alphabetical list, which you scroll through to find your chosen brand. This makes fast work of adding each piece of AV kit, although we did run into a few problems when trying to add our TV. After several attempts, the button functions were still not stored, so the Prestigo offered two choices, one of which was a 'full search', which would have involved holding down one button on the remote for 'up to half an hour'. So instead, we opted for adding the button functions manually, which was a simple process that used the TV's remote to store its functions on the Philips. It also enables easy setup of an 'activity', which is a sequence of key presses, which can be installed in order to perform a function such as powering up several products at once. This is a great remote control replacement, but for £100, we would have liked something a little more comfortable to hold and easier to read. Hopefully, future models will have ironed out these kinks.